Apple Airpods is a pair of wireless earphones that works together with other Apple devices like the iPhone. The Airpods are very lightweight and weigh only 8 g. The accompanying case where you store the earphones weight 38 g.
Apple surprised the tech community during the launch of iPhone 7. The company controversially ditched the earphone jack and announced that the new phone instead pair with a wireless Airpods. The pairing is accomplished with the Bluetooth W1 chipset that automatically connects to devices running iOS 10, MacOS Sierra and WatchOS 3. 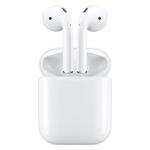 A newer model Apple AirPods 2 was released in April 2019.